Worth it if you need a good nap. A great movie. Wonderful story line. Great acting. Highly recommend. If you enjoy the development of character, this for you. It is the story of the dynamics between two brothers, as well as other character's life pupose. The fact it is a western is almost irrelevant. It could be set any time or place. The comedy was dark, and it's only point was to juxtapose the intricacies of tragic choices people have to make. No, it's not as good as the book. But movies rarely are, because they don't have the time to go in depth. Too dark and boring. Do not recommend. Nothing like the old westerns. If you like the old type westerns, you will enjoy this movie. It was billed as a comedy but it has few comedic situations. Interesting relationship of two brothers on a mission and their journey for each to find their goals in life. 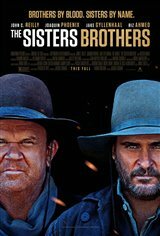 A gritty, realistic western!! Tough times...wasn't the pretty saloon girls of John Wayne era...found the characters interesting and complex. Great movie! This was a totally awesome movie/comedy/western!!! Don't believe the dummies who commented below...'violence toward horses...' I mean, REALLY?! it was a western period piece from the 1800's for God sakes! Get real people...and the comedy was funny, the acting and story great. Me thinks some political views involved in those reviews below like for instance 'we must have clean and happy white bright westerns of the 'good old days' when 'Merica' was righteous and great taking over the land from all those unsophisticated 'natives.' Geeeshh.